There is no russian language and so everything is normal, it came quickly, i recommend the store. All seems fine. The Lenovo watch app is not the greatest but (obviously) that's not the store's fault. You cannot get reminders from all of your applications (like Viber), just Twiitter, Facebook, Skype, Whatsapp, Weibo, WeChat and few others. 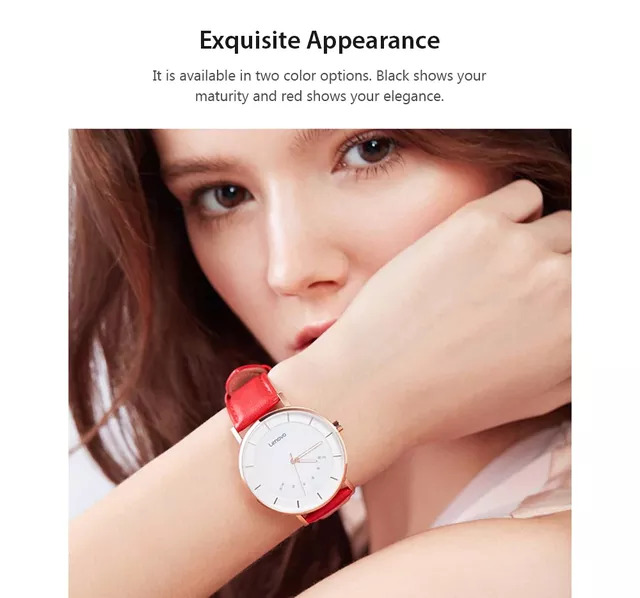 The watch itself is quite nice and well made. The delivery was quick. Very beautiful watch. Came quickly in two weeks. Came with a full charged battery. Updated without problems to the latest version of the firmware. Great watch! Constantly i wear xiaomi huami amazfit bip, now i decided to try a shooting hybrid from lenovo. I ordered myself black, and my wife white with a red strap. Impressions are the most positive. The clock is quite informative, the second hand shows all the information i need, vibration works fine. Quite adequate android app. I do not understand why it's all scolded, i have on 9 android all the functions work stably, even a child can understand. The only thing that did not like-long sending and delivery of goods (almost a month). I will not shoot a star for this, because the product is quality and fully corresponds to the description. The goods arrived quickly. Packed perfectly. Satisfied with the goods. I liked everything. The product is super! While it works fine. Completely tested has not yet managed. Cute, stylish. By curve :(. I hope in the update will correct ..